Aggie Westons receives £1000 from HMS Sultan — Aggie Weston's – Helping serving sailors, marines and their families. 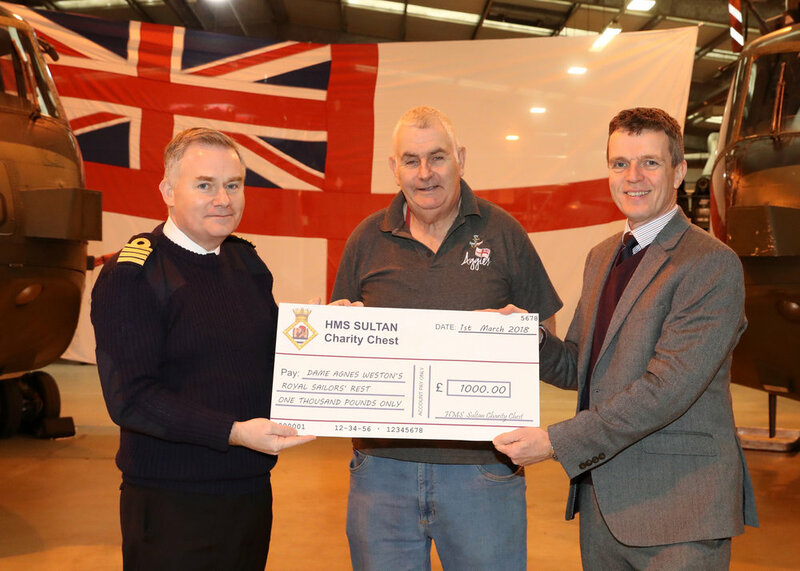 Captain Pete Towell from HMS Sultan presents a cheque to Steve Howlett, Aggie Weston's Pastoral Worker and Craig Fulton, Aggie Weston's CEO. Each year HMS SULTAN runs a series of fundraising events with the largest being the SULTAN Summer Show and the SULTAN fireworks in November. Once per year they split the money that they have raised between worthy local and naval charities. This year, in recognition of the valuable work that Aggie’s Pastoral workers do amongst the personnel of HMS SULTAN they selected Aggie Weston’s as one of the benefactors. Craig Fulton, CEO of Aggie Weston's said "We are very proud of the work that our Pastoral Workers Steve Howlett and Rebecca Baird have been conducting with the personnel at HMS SULTAN and are thrilled to have the work recognised in this way by the Captain of the Base. This kind donation will be used to help sustain charity’s pastoral support programme". Aggie Weston's Pastoral Workers at HMS SULTAN are based in the Chaplaincy Haven and run a number of events across the week, month and year to support staff and personnel serving on the base. For more information on their work please contact the Aggie Weston's Head Office.